Cecilia Tkaczyk’s underdog victory on a campaign finance reform platform should stir up the struggle against money in politics—and push the governor to take a stance. Governor Andrew Cuomo of New York (AP Photo/Mike Groll). One of the last results from Election Day 2012 is also one of the sweetest. Running in a district gerrymandered by Republicans, grassroots candidate Cecilia Tkaczyk scored a stunning upset over millionaire Assemblyman George Amedore in a New York State Senate race. Even better, Tkaczyk—and the grassroots army that powered her to victory—did it by making campaign finance reform the signature issue in the race. Tkaczyk’s victory, achieved by a nineteen-vote margin following a recount that ended Friday, is a shot in the arm for progressives. It’s also a test for New York Governor Andrew Cuomo, who’s counting on progressive votes in 2016. Tkaczyk faced daunting odds. A poll one month out showed her down by twelve points. She was running with a cash disadvantage, in a GOP-gerrymandered district, with little name recognition and a hard-to-pronounce name. With little left to lose, Tkaczk and the key groups supporting her made the race a referendum on democracy itself. In the mail and at the doors, they let the voters know that a vote for Tkaczk was a vote for publicly financed elections. Her GOP opponent agreed: Amedore began warning of a “Cece tax” that would finance such a system. According to conventional wisdom, that should have been the death of Tkaczyk’s already-underdog campaign. Conventional wisdom was wrong. As Tkaczyk said in a December op-ed, while a furious recount battle was still underway: “Passing Fair Elections reforms, including the public financing of campaigns, was one of my campaign’s core issues…If I do get sworn in, I’ll know my support for public financing is a central reason I won the job.” A month later, the job is hers. Tkaczyk’s victory is a testament to the power of grassroots and netroots organizing. It took savvy, tireless work by Working Families Party, Citizen Action of New York, Progressive Congressional Campaign Committee, MoveOn and the new “anti-PAC PAC” Friends of Democracy to make it happen. And it took a righteous cause: getting money out of our elections. In one statewide survey, 79 percent of New Yorkers supported comprehensive campaign finance reform; just 8 percent were against it. Voters in Tkaczyk’s district heeded that call. But will their governor? Over the past few months, Andrew Cuomo had the opportunity to help secure Democratic control of the state senate. But he passed, neither endorsing Democrats against Tea Partying opponents, nor lifting a finger when senators who were elected as Democrats moved to erect an alternative majority coalition with the Republicans (a result that’s neither Democratic nor small-"d" democratic). Now Cuomo faces a new test. The governor has said he supports campaign finance reform. With Tkaczyk’s victory, the votes are there to pass it. 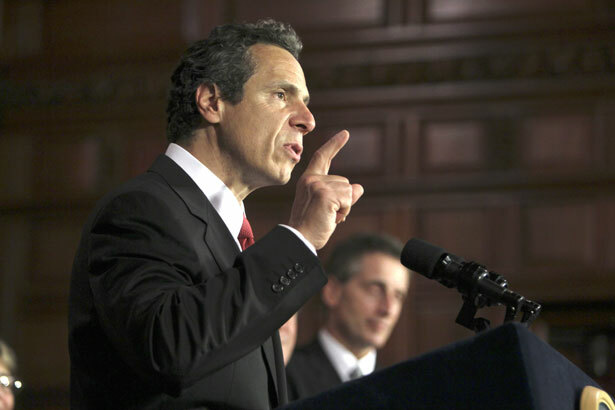 But now that clean elections reform is in reach, will Cuomo defy his business-class supporters? After all, Cuomo’s recent high-profile liberal moves on guns and abortion, while welcome and worthy of celebration, don’t threaten the power of the business folks backing him. Campaign finance reform would. And it would pave the way for rent regulation, progressive taxation, living wage laws and other reforms that differ from the “socially progressive, economically conservative” agenda the governor has pushed to date. As we saw with New York’s new gun laws, Andrew Cuomo knows how to get a bill passed when he really wants to. But tepid statements aside, it’s far from clear that Cuomo actually wants campaign finance reform, or other progressive economic measures to which he’s paid lip service. If Cuomo joins arms with the Senate Democrats and Assembly Speaker Sheldon Silver (long a champion of this reform) to muscle through clean elections in New York State, he’ll earn a fresh look from skeptical progressives. Katrina vanden Heuvel last wrote about the NRA’s Fast and Furious scandal and the flow of guns over the border to Mexico.